Unlike dive bars, cocktail bars specialize in creating intricate concoctions with fresh ingredients and home-made recipes. Each cocktail bar has an assortment of basics, sure, but the good stuff comes when the mixologist lets their creativity loose. Discover the flavors of Maryland’s best at the following 10 bars. Bookmaker’s in Baltimore, Maryland is a Readers’ Choice Award Winner. They promise “an intimate and relaxed cocktail experience that offers something different to local patrons and ensures you enjoy a memorable and personalized drink experience every time.” Come in for a nice drink and live music. Level is a multi-award winning “small plates lounge,” serving cocktails and, as you may have guessed, small plates. They use seasonal ingredients in their cocktails and entrees, many sourced from the nearby Chesapeake Bay. Cocktails include many classic-inspired drinks with a Level twist. Ky West Restaurant and Lounge offers live music Wednesday through Saturday, an outdoor patio, and signature drinks with a Happy Hour every 2-6 p.m. Drinks include Ky West versions of many favorites, including Ky West Crush, the Ky West pear, Summer Sour, and more. Perry’s Restaurant and Cocktail Lounge is “a truly friendly restaurant and bar that offers something for everyone,” according to Suburban Scene Magazine. They have a Happy Hour every Monday-Friday from 3 p.m. to 7 p.m. and half price wine on Monday. Market Tavern, a gourmet market and neighborhood bar, is located in historic Sykesville, and stocks local beer, tapas, and classic cocktails. They serve specialty foods like salted chocolate, artisan spreads, and gourmet snacks. The cocktails are mostly the classics done just right. Tyber Bierhaus in Bethesda, Maryland is a beer garden and cocktail bar, named one of the best in DC by The Washingtonian. They have Happy Hour every week day from 4-7 p.m. on Tuesday-Friday and all-day Monday. Try their rail cocktails. The Wildwood Kitchen in Bethesda, Maryland offers “unique, modern cuisine influenced by the 23 countries surrounding the Mediterranean,” and places an “emphasis on coastal offerings” served with classic cocktails. Come visit for Happy Hour from 4-6 p.m. or anytime for craft cocktails like the Titan (four roses bourbon, Averna, apricot preserves, bubbles). The Cellar Door offers “American-Casual cuisine” with robust nightlife offerings almost every night of the week. The food is great on its own, but the main attraction is the cocktail menu. Try their seasonal cocktails or bourbon cocktails: You can’t go wrong with anything on either menu. Bolder in Airy, Maryland “focused on local flavors in a relaxing atmosphere.” They’re proud of their intimate atmosphere and seasonal ingredients. Every cocktail is handcrafted with premium liquors. 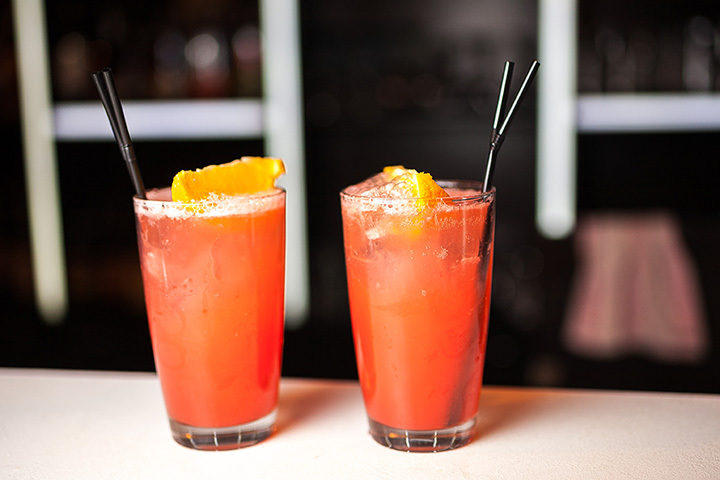 We recommend the Twisted Peach Crush, made with Van Gogh cool peach, grapefruit juice, cranberry juice, and prosecco.